The bevels have been on the bench for several years but it was now time. The finished panel measures 13″ by 24″. This may be my last bevel piece as they are more difficult than they look. The difficulty lies in (1) getting the bevelled pieces to fit together in the lead came channels that provide rigidity, and (2) cutting the four curves in each of the four corner pieces and fitting them to the bevel came so that there are no light leaks. Bad stuff happens and I had to recut one corner piece. I’m glad I did the piece as the bevels gather the sunlight beautifully. Barbara and I recently took a drive up to the shops of Peddler’s Village in Bucks County. One of them specializes in unique crafts pieces which they import from all over the world. A set of lamp shades and lamp globes caught my eye, each made of tiny pieces of glass handlaid into a matrix material. Couldn’t walk past it. Another candidate for my placemat series. A Sunday afternoon with no commitments brings me to the back roads of Salem and Cumberland counties. It was beautiful to be out in the country, passing farm fields lightly dusted with snow under a stunning blue sky and not a McDonald’s in sight. At one point I found myself driving into Alloway, still a country village, one where my maternal grandfather, William Rudolph was born. I set out to revisit the family plot which I had discovered a few years ago. Nevertheless, I still wondered through the wrong (Methodist) cemetery, gave up and headed to the Baptist Cemetery where I found it. 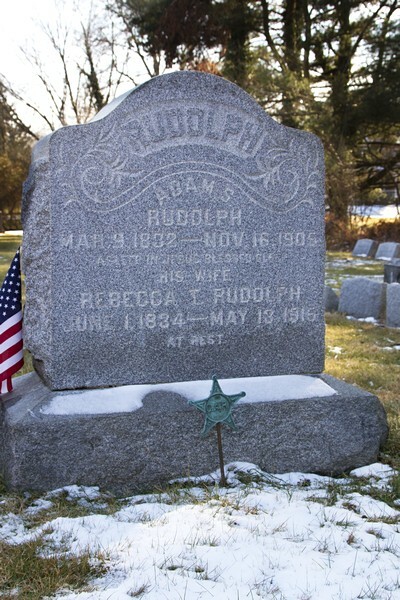 The monument is for my great grandfather, Adam S. Rudolph, a civil war veteran, born in the early years of the 19th century while Andrew Jackson was president. He and his wife, Rebecca McPherson, brought my grandfather, William, into this world in 1875. This was a “How about that?” for me as I now understood where my mother’s name, Rebecca McPherson Rudolph came from. It is even more interesting to me in that my late wife and I named one of our daughters Sigrid Rebecca, and she, in turn, has a daughter Madeline Rebecca, and my late brother’s son, Chris, has a daughter named Rebecca as well. Nice. Wonderful way to start the week – Thanks Ralph! 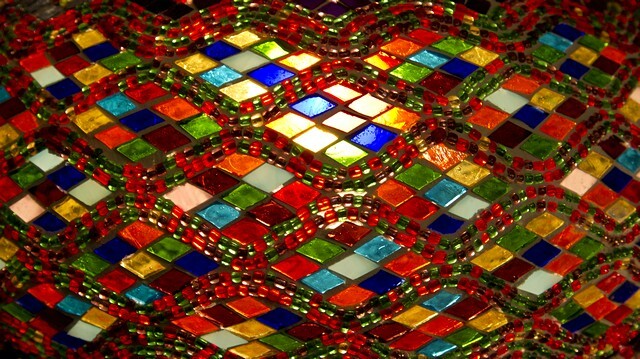 and your stained glass is beautiful!! 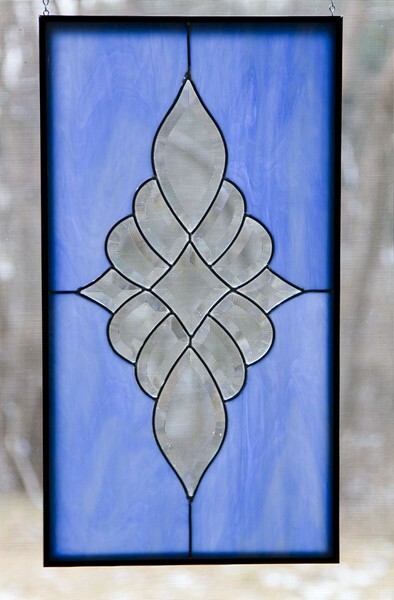 I used to do stained glass work and I know how frustrating it is to work with bevels! I really hope to get back into it one day soon. Your panel is stunning. I think it is wonderful to know your family’s history. So many people don’t. Thanks, Bonnie. Once it’s done, it was fun. Glad to see you’re making stained glass again. Too often we never “get around to it” again when it comes to activities we enjoyed so much in the past. The new panel looks great and I can imagine the prism effect. Thanks, Terry. I enjoyed the bio you just sent in. Mid-state is, I think, the best part of the state. Looking forward to rocky coast and desert flower images. that you keep so busy. Plus your work is beautiful. Thanks, Jeane. Not bad for an old reactionary, huh? OMGosh! The stained glass peice is gorgeous Dad! Very cool too, to know about Great Great Great Grandfather/Grandmother Adam & Rebecca! It rings a bell that the name Rebecca went back pretty far in our history. 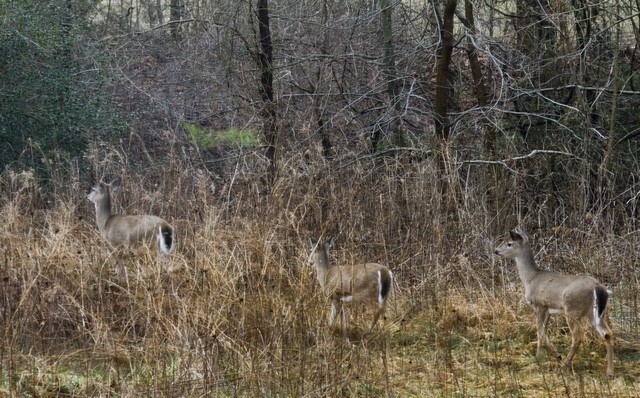 How exciting it must be to see the Deer. Happy Monday! Hugs! Thanks, Ki. Heard from Chris B. also in re his daughter, Rebecca. Great stories and beautiful stained glass. I took a class once and made a small piece that is hanging in my office. Thanks for sharing. Thanks, Pat. Go ahead. Make one more. Thanks, Roz. Looking forward to seeing you all next week. You are certainly a man of many talents, Ralph. It’s nice that you’re able to continue to pursue your interests in your new(ish) home. Thanks, Linda. I’m really enjoying it. Love the stained glass. I looked back at your other works. Very nice. Following your family tree is just fascinating, isn’t it? Reminds me that I should take a day and just wander. Thanks Ralph! Beautiful…thank you for sharing, Ralph. Thanks, Mike. I’ve also walked the land in Minnesota where my paternal great-grandfather settled his 160 acres under the 1862 Homestead Act, and seen the depression in the land where they lived their first year in a dugout. I’ve also picked through the excavation of the late 1600’s Blue Anchor Inn near today’s Society Hill Towers, an inn once owned by a forebear. The geneology thing is fascinating and fun. but I sense a vast black hole into which one could disappear. Careful, this Comment is turning into a post. You are a real Renaissance man with many talents! I admire your ambition and productivity. I’ll agree to ambition but the productivity is more and more of a strain.